These concepts form the basis for acupuncture, zone therapy, yoga, and mindfulness, among others. Many people are not aware that zone therapy, acupuncture, yoga, and mindfulness are spiritual… I trust that the following explanation will settle this misunderstanding – although I am aware that I may receive a lot of criticism for my views! The following is NOT written to condemn, but to inform! The meridian theory was originally expressed by the Chinese on the basis of observations of illnesses and holistic treatment: The body has 14 meridians of which six of them run op and down the legs and across the body. An additional six run along the arms and across the body. And finally two meridians run on the mid line of the body at the front and the back of the torso. The 14 meridians – or energy lanes – are divided into yin and yang. 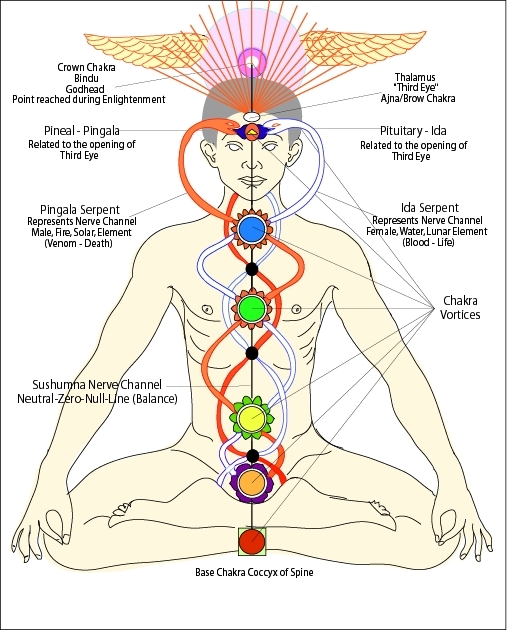 The Indians call the energy centres of the body “chakras”, whereas the Chinese call them “meridians”. They say that the ethereal body normally has seven big chakras. The root chakra is the lowest one and the other ones are located on a line that runs up to the crown chakra, which is at the top of the head. qi, (kin. ‘breath’), Ch’i, principle in traditional Chinese philosophy and medicine. Qi is the life giving force that flow through everything in the universe and is the opposite of li, which is the inherent principle of all things. Traditional Chinese medicine understand qi as being yang, the active and motivating force in a human being, which is complemented by the blood, which is yin and basis of the bodily functions. So meridians are understood as being spiritual channels, and Qi runs through all living in the universe, circulating in the body through the system of meridians. When Qi and the blood are in balance with each other and flow in harmony through the body, the veins and the inner organs it causes a condition of physical and mental harmony, according to the meridian theory. Any deviation from this condition results in illness, and many factors may be the cause for this. The basis for applying the acupuncture points in the shape of zone therapy and ordinary acupuncture with needles is the spiritual and holistic theory of Qi. Along the meridians are also the acupuncture points, which influence Qi. Through pressing these points it is possible to influence/regulate the spiritual energy system. This influence is able to remove any blockings and re-establish the “natural flow of energy”. The theory goes that through influencing the 365 acupuncture points and 14 meridians, the nerve system is stimulated to release chemical reactions into muscles, spinal cord, and brain…. Nevertheless, the meridians are spiritual and they release “the spiritual activity of the universe” into the body. It is believed that any hindrance or blocking of these spiritual flows of energy will lead to an imbalance in the body- an imbalance between Yin and Yang (light and dark energy) – at some point in time. …and what has all of this to do with yoga and mindfulness??? Yoga is a Buddhist technique used in breathing exercise and meditation. The purpose is to activate the seven chakra points of the body thereby awakening Kundalini energy, which opens the third eye (opening up to a spiritual dimension). Mindfulness is the exact same thing, trying to ‘rein’ the brain. Actually, the object of mindfulness is to find ‘peace in yourself’ and ‘peace with yourself’. In Buddhist terms, mindfulness is a liberating tool that facilitates a person’s journey toward spiritual wisdom and a deep spiritual and mental awakening. Scary, but true…! Many people who receive in this kind of ‘healing’ experience a temporary improvement in their condition, but after some time they get overwhelmed by fear and anxiety and sometimes attacked by other diseases. … and now schools, job centers etc. have adopted mindfulness and yoga as compulsory subjects in their curriculum. I kindly decline! Acupuncture is being offered as a painkiller at hospitals, chiropractors, and physiotherapists – so how are people to know that it is not OK unless they are informed that a spiritual reality is behind…? No!!! Exercises are fine, but yoga is just not okay. Why can’t we just stick with normal exercises? Why do we have to do Yoga exercises? If yoga is just ordinary exercises, then there is no difference between yoga and normal exercises, is there??? Or could it be that the yoga makes the effect “stronger”?? And what would be the reason for that?? Let’s use a different angle… why do we Christians not occasionally step out and refuse to live like the world? Instead of “getting off the train” we often stay in one of the wagons. I refer to things like mindfulness. We change the name to Christfulness and suddenly we think it is acceptable. Yes, I KNOW that some people call ordinary prayer and being baptized with the Holy Spirit “Christfulness”, but why don’t we just call it what it is? Why do we HAVE TO follow the leadings of the world and mix it all together? I’d like to compare it with a non-Christian listening to intense praise and worship music and “just” takes it in as ordinary music. Wouldn’t it open that person’s mind to God in his or her “subconscious mind”. Or if a person constantly listen to “death metal” with the lyrics “I want to die”, what is the effect of that. What is the effect of that – even though the person just likes the rhythm and don’t notice the words… Whatever way you look at it, the two things are inseparable (to the best of MY belief)…. You are SO right that it works. 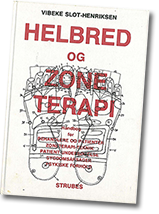 Believe me, my own mother ran “The Zone Therapy School of South Jutland” for 25 years and she trained people to be zone therapists and acupuncturists with GREAT success. She saw MANY sicknesses disappear… so I do not doubt for a second that there is a lot of power in that (and in other alternative methods such as Kranio Sakral Therapy, Kinesiology, Reiki Healing, Tantra, Yoga, and Mindfulness etc.).. but must we take in everything that works? Must we really (even we Christians) ignore the power of God and accept all other spiritual treatments? When the healing is spiritual and not from Jesus, what would be the source?? So don’t ask God to remove “the mountain” for you, but speak to it and command it to move … and sometimes it takes a bit longer than just five minutes. Like when my wife was healed of sclerosis at the Easter of 2014. It took three hours before it left. I’m not saying it is an easy battle, I’m saying we must not give up! If you have seen just one case of the deliverances that I have seen, where people have opened up to “the alternative world” you’d change your attitude on the spot, I guarantee! I have seen people vomit again and again and seen them squirm like snakes as they were being set free from “the alternative way”. It’s not fun…. the devil is happy to give, but not without taking something. In closing I want to say this… “Do NOT be fooled”. Many healers claim that they heal in Jesus the Master’s name – or in Christ the Master’s name or in God’s name… If you press them a bit, you’ll find that they do not know the Bible and they do not heal in the name of Jesus Christ (the name of the son of God). Instead they heal with “the divine power” and they believe that all supernatural power is from God. Jesus the Master is NOT the son of God, Jesus Christ of the Bible, but it is a demon with “divine” power. The same applies to the spirit of “Reiki”, “The Source of Light” and “masters and angels” such as Sct. Germain, Mary, the archangel Michael, or Celeste, etc. “Once when we were going to the place of prayer, we were met by a female slave who had a spirit by which she predicted the future. She followed Paul and the rest of us, shouting, ‘These men are servants of the Most High God, who are telling you the way to be saved.’ She kept this up for many days. Finally Paul became so annoyed that he turned around and said to the spirit, ‘In the name of Jesus Christ I command you to come out of her!’ At that moment the spirit left her. …and finally these verses where Jesus explains that He ALONE is the way to God.